We decided to find the company he used and reached out to them. The company name is Hostito and they were located in San Francisco, but it appears they are no longer there and might be run out of Chile. Nevertheless, we tried their phones numerous times throughout the week and left messages, none were answered and noone returned our calls. We filed a ticket and then went to see if other people had this problem. Yelp has an entry for them here: Yelp’s Hostito Listing . Dealing with a nonresponsive and potentially defunct registrar and hosting company doesn’t help us get a client back online. We went back to our client and gathered all the logins he had. We then used the very awesome website, https://dnshistory.org/ , to look up the old A record for his website as the cpanel login details provided were on the same server his website. Tried the logins….. and no good. No password reset option either. We don’t know if the client changed the login or the host did. Experience has taught me that clients generally don’t change passwords they write down as these logins were. Clients that tend to memorize logins have a tendency to reset more often when they forget. Just how it goes. So we can’t fix this problem directly through Hostito. Can you see where this gets frustrating? The thing most people don’t know is that if a small company is registering domains, they are usually doing it on a retailer account through GoDaddy, Google domains, Namecheap, etc. If they want to automate and go a little larger they use a wholesaler and resell it through them. The largest is Enom, and that’s who Hostito uses (and actually Namecheap as well). Our billing system handles Enom reselling but we have no current plans to implement it. With this in mind, it makes logical sense to go over Hostito’s head and try to move the domain into Enom directly, or another reseller. Not having a need to do this before and being short on time, we called Enom for information. They said yes, they could transfer the domain out… but we’d need to agree to a 5 year registration. I explained to them how ridiculous this was but requested a quote anyway as my client was in dire need of getting his email back up. I guessed $150 but they quoted a ‘special’ for $200. When this process was completed we were informed it would be a few days to process the transfer. No good, he’s been down 2 days at this point. So Enom forced him to go through the $200 5 year renewal. Market rate for a domain is typically around $10/yr. Enom failed to police a business (Hostito) that’s continuing to bill customers while failing to properly update their domains and is profiting by screwing over the defrauded victims by using the maximum amount of time to process a transfer under ICANN regulations and/or charging 4x the market rate at 5x the usual term. Their salesman had a ‘take it or leave it’ mentality knowing we were stuck taking this option. We consider this an unethical practice and are calling them out on it. Andres from Hostito reached out by email 3 days after our initial ticket. They informed me that they no longer controlled the domain. 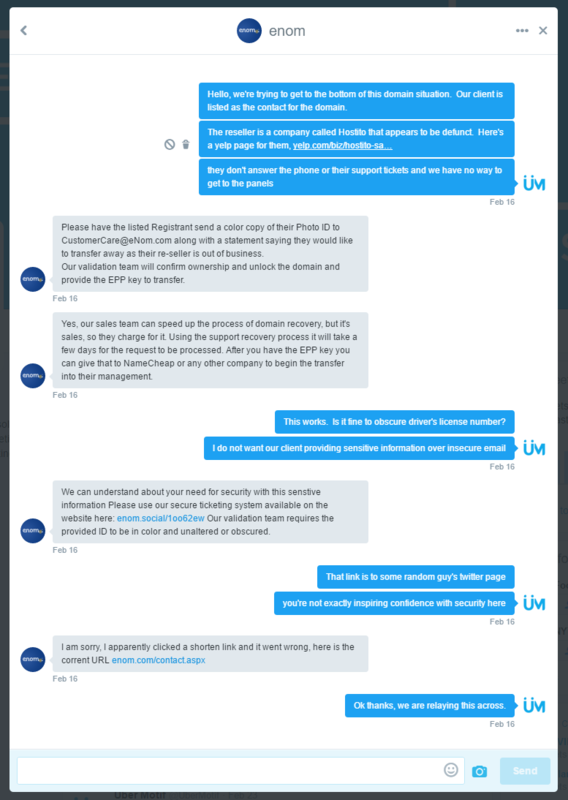 I informed them of the above regarding the Enom transfer and asked them on what planet it was acceptable for a company in that industry to have a 3 day response time to a basic ticket. We still don’t have panel access to his site, at this point it’s looking like we’ll need to recreate it. If you’re with Hostito, maybe they used to be a decent company. But it’s become obvious now that they can’t manage basic support requests and will continue to autobill without checking to see if services are performed. What’s interesting is that their own domain expires tomorrow, we’ll see if they can even handle renewing their own. If you care about your site and/or domain get it off this service before you have to go expensive routes like the Enom extortion plan. Hopefully my information helps someone. We do provide hosting services and assistance navigating through this sort of thing so reach out in comments or send us an inquiry. Finally, if you were affected by Hostito’s failures or have also been screwed by Enom’s policies in a similar matter, I urge you to lodge a complaint with the relevant government agencies: I suggest the Federal Trade Commission and ICANN. The FTC deals with consumer fraud and ICANN deals with domain registrars who aren’t in compliance. Also, make noise. Share this where you can until they clean up their act or announce a proper wind down. Yelp and BBB are useful for letting people know, but they have no ability to enforce, I wrote this to provide information for people stuck already in this situation. Thank you Uber motif for going above and beyond with this issue we had. Without knowing the inner workings of this process myself, you made this possible and as painless as it could be. Our email and site are back and our business was spared from disaster.